The National Register of Historic Places lists more than 3,000 sites in Austin and 17 National Register historic districts. Located in Central Austin, just north of the University of Texas campus, the Hyde Park Historic District is Austin&apos;s oldest suburb and was once home to the State Fair of Texas before its move to Dallas. Today, visitors can still experience Hyde Park&apos;s quaint streets, beautifully restored historic homes, museums, shops, restaurants and more. Gated Entrance to Hyde Park in the 1890s, PICA 02628. Courtesy of the Austin History Center, Austin Public Library. 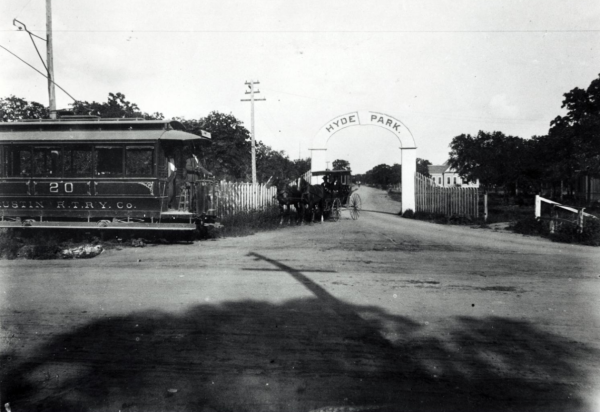 In 1891, Hyde Park was a remote neighborhood from downtown Austin. Streetcar service made it possible for Austin’s first suburbanites to settle in the quiet, rural area. Developer Monroe Shipe created wide shady streets lined with handsome Victorian and Craftsman houses (his own home still stands at 3816 Avenue G). Today, Hyde Park is considered part of Central Austin, but its residents continue to take pride in their neighborhood’s unique identity. Approximate boundary: Guadalupe to Duval Street; 38th to 51st Street. Elisabet Ney Studio & Museum. PICA 17563, Austin History Center, Austin Public Library. 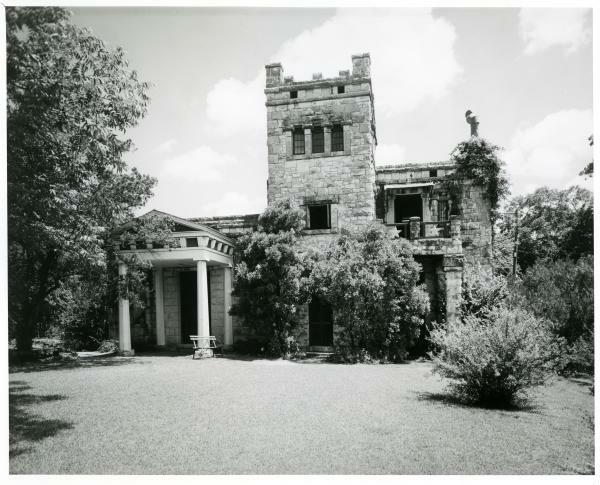 In 1892, Elisabet Ney, a German classically-trained sculptor, moved to Austin and built “Formosa,” a remarkable Neoclassical and Gothic Revival studio. Two famous pieces – statues of Sam Houston and Stephen F. Austin, now in the south foyer of the Texas State Capitol – were created here. The museum is dedicated to her art and legacy and houses the largest collection of her work in the world. Free admission. This quiet neighborhood park sits adjacent to the Elisabet Ney Museum along Waller Creek. Enter under the arch rock sign, created from recycled pieces of petrified wood from the Petrified Forest Lodge which was open from the 1930s until 1999 (the historical marker sign can now be found on the southwest wall of the Walgreens at 4501 Guadalupe St.). Pack a picnic and enjoy the shade of the old post oak trees while the kids enjoy the playground and community-funded mosaic mural. The original log cabin structure has served as a home for recreational activities in the neighborhood since it was built in 1928. Recent restoration projects include the renovation and addition of two new pools, expected to open in summer 2018. Founded in 1899 as the original Austin Country Club, this beautiful and quiet 9-hole course is situated alongside Waller Creek at the eastern edge of Hyde Park. Harvey Penick, University of Texas golf coach for more than 3 decades, began his career as a caddy here at what is now one of the oldest courses in the United States. Nestled among large old oaks in northwestern Hyde Park, Avenue B Grocery is Austin&apos;s oldest continuously operated grocery store. Built in 1909, this white clapboard grocery and deli serves up sandwiches of all styles along with Texas-style chili and other grocery and novelty items. The King Combo and Queen B (vegetarian option) are two of the best known options, but you won&apos;t want to miss the southern-style homemade pimento cheese on white if you&apos;re feeling nostalgic. The Shadow Lawn Historic District is a small historic neighborhood situated within the Hyde Park subdivision. Visitors can still view some of the original concrete markers throughout the neighborhood, and the neighborhood boasts some of the most impressive historic homes in the city. Many of the homes are in the Tudor Revival (such as the Peter and Clotilde Shipe Mansbendel House at 3824 Avenue F), Queen Anne (such as the Oliphant–Walker House at 3900 Avenue C) or Bungalow styles. 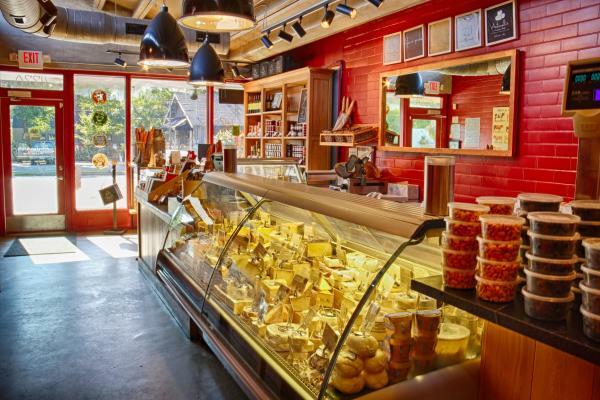 Antonelli&apos;s Cheese Shop. Credit Elijah Whites. For the full Hyde Park experience, visitors won&apos;t want to miss a meal in the Duval Center area, along Duval Street between 42nd Street and 44th Street. Dining options include the original Hyde Park Bar & Grill, which opened in 1982 and is located in an 1920s Craftsman-style home; Dolce Vita espresso and gelato bar; Mother&apos;s Cafe, which specializes in vegetarian and vegan homecooking; seasonally-focused Italian trattoria Asti; and Antonelli&apos;s Cheese House, which is open for classes and events, and the Antonelli&apos;s Cheese Shop where visitors can buy gourmet cheese, charcuterie and wine directly from the local cheesemongers. In the evening, enjoy live music and classic deli fare at the NeWorlDeli. Or, experience local talent in action at the Hyde Park Theatre, an established theatre focused on developing artists, writers and designers in the alternative arts scene. On the western edge of Hyde Park, along Guadalupe Street, you&apos;ll find the Mondo Gallery, an art gallery which showcases art in various mediums inspired by film, television, comics and more.